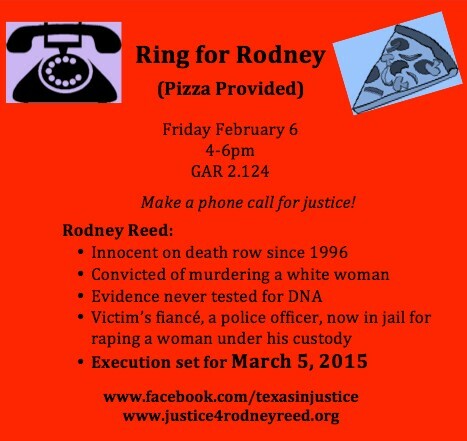 Call in for Justice | Free Rodney Reed! NEXT CALL IN DATE IS FRIDAY, FEBRUARY 20! National call-in days show the Governor and Board of Pardons and Paroles (BPP) that all eyes are on Texas and there is widespread support for Rodney. The Campus Campaign to Save Rodney has made a very useful handout with sample scripts that anyone can use. Governor Abbott can be reached at 1-512-463-1782 and the Board of Pardons and Paroles Clemency Section can be reached at 1-512-406-5852. Individual BPP members’ phone numbers are listed on the sample scripts page. Consider hosting a “Ring for Rodney” event in your community on one of those days. You can make phone calls, talk about the case, and write clemency letters. Justice for Rodney Reed. You are about to execute an innocent man! Rodney didn’t do this. The evidence will prove it. Give him a chance before it’s too late. Don’t let that Good Ole Boy crap be the reason to take a life. Do the right thing. Please don’t kill an innocent man!! Give him a new fair trial….let him prove his innocense! And in the innocent man as all of us who have reviewed the evidence can say I hope the state of Texas will do the right thing! Rodney was dating Stacy Stites. Evidence shows that is a shadow of a doubt a huge one. Stacy Stites and Rodeny Reed deserve justice. Please spare Rodney’s life. Please don’t kill this innocent man. Thank you. Please give Rodney the chance he did not get to prove his innocence. Before you make a mistake killing the wrong man please pray and be sure what you are doing is God’s will..
Texas, you are compelled by LAW to give Rodney Reed a new and proper trial in this case now that the medical examiners have recanted their testimony, now have realized that the time of death was incorrect, therefore it would have been impossible for Rodney Reed to have killed Stacey. You know who killed this girl and so does all the world’s eyes watching you. You would think you would want to be sure that the man you are putting death is in fact guilty, OR DO YOU! It seems that the state of Texas is a bloodthirsty place to live and I’m glad I don’t if this is your idea of justice. You should all be ashamed of the cover ups in this case not to mention the murder of the lead investigator, or so sorry, your calling it suicide, why doesn’t that surprise me! This is a disgusting display of abuse of power and you will not get away doing this to innocent people anymore to cover up your dirty cops, judges, and everyone else who has been involved in this ridiculous thing you call a case! What are you afraid of by having the DNA tested, those beer cans tested, are you afraid that you will get the answer about her finance and that you will have been wrong? Then you will have to be accountable for all of the lies and cover ups done. So, does the state of Texas following the law, or do they believe they are above the real law and their vigilante law is how they handle things, you people all apparently haven’t realized that you are in the 21st century, black and white people actually mix, are friends, lovers, family. GONE are the days of you getting away with this sort of garbage! I’m surprised you haven’t just thrown a rope over a tree and call it a linching and a day, ARE YOU PEOPLE KIDDING! JUST LOOK AT THE FACTS OF THIS CASE FOR GOD SAKE! If in fact you decide to execute Rodney Reed without being 100% sure, then you, TEXAS, AND ALL THE PEOPLE THAT LIVE BY YOUR LAW ARE THE ONES WHO ARE GUILTY OF MURDER NOT RODNEY REED! DO WHAT IS RIGHT STOP LIVING IN FEAR OF THE TRUTH BECAUSE IT WILL PREVAIL EVEN IF THE STATE OF TEXAS DOESN’T LIKE IT! AMEN SISTA!!!!!!!! You are damn skippy on all you have said here….love it all!!!! !